There’s one day to go til the release of our new single, but I’ll admit I’m not as excited as I know I should be. The news of Steve Job’s passing is impossible to ignore when writing about the music we have made on the Project. Matt shared a link to the commencement speech he gave at Stanford University in 2005 and I watched through it this morning. That was certainly the most significant thing Jobs ever did for me: simply telling his life story. So, moving on. How am I going to talk about baby? I suppose it’s quite obvious. This single is our first, and the Project itself has been jam-packed full of firsts. It’s also something close to our hearts, something we’ve had to ‘raise’ and been able to see growing and changing over the past 4 months. Working on Mirrorball Swing has been a renewing experience for me. It’s reminded me that there’s no need to be weary. There is so much out there new and undiscovered. I don’t have to feel like it’s already the end of the line for me just because I didn’t land a major label deal before I hit 20. In other ways I feel like I’ve been starting from scratch. Writing for this genre is very different from writing for pop or rock. I feel as though the material I write for Glitter Punch and the things I write on my own don’t end up sounding too different in the end. However I know I’m employing completely different processes to reach an electro-friendly conclusion. To be honest, I don’t know for sure if what I’m writing is working. Does it sound acceptable for the genre? A bit too weird? Perhaps it’s that newness, the ‘baby’ feeling. I certainly don’t have a voice that you would readily associate with electronic music. Maybe that’s part of what makes Glitter Punch a bit different. I hope that works in our favour. I hope Matt won’t mind me saying this (seriously dude, if you don’t keep up with my GP blogs on your own head be it! ), but in some ways he has had to deal with the ‘baby’ feeling himself. I didn’t know this when we started, but I found out recently he hadn’t done a lot of original composition before we began work on the Project. His earliest mashup on YouTube was from just over 2 years ago. Granted, you can learn a whole lot in that time by chopping and changing pre-existing audio, but to make the jump to original material requires a lot of courage and a bit of trial and error. “I have no musical knowledge whatsoever.” he said matter-of-factly (that right there is a CLASSIC line). He told me he started writing, “about 2 months before we started doing Glitter Punch.” My explosive reaction to this is well documented. Haha, so we’re actually mad! Both putting so much effort into something when neither of us really know what’s going to come out the other side. Let us remain childlike and fearless. Electric light disco babies! 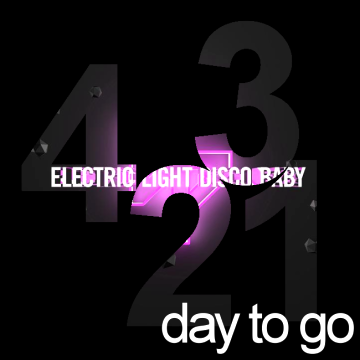 Electric Light Disco Baby will (hopefully!) be good and ready to download from Amazon MP3 as soon as the 7th comes along. Still no word on iTunes, although we have been listed as an artist when you search for our name or the title of the song. Thanks for following me on my blogging journey towards our first release. We’re waiting in the wings on iTunes.